Anyway, as I've said I am watching our high frequency indicators especially to contrast the forces of continued strengthening (initial jobless claims) vs. Oil's choke hold on the economy. As I've reported already, both moved to or past their inflection points this week. Initial jobless claims came in at 381,000 and the 4 week average at 402,000 is the lowest since before the Black September 2008 meltdown. At the same time the price of a barrel of Oil briefly crossed $100, pushing it past the point of 4% of GDP that in the past has heralded recessions. Oil jumped over $10 to $97.88 a barrel. Gas at the pump rose five more cents to $3.19 a gallon. This is an increase of $.50 in 4 months. If this week's spike in Oil does not reverse, expect pain at the pump to be palpable shortly. Despite that, this week gasoline usage was 37,000 barrels a day higher than last year, or +0.4%, all things considered a welcome sign. Railfax showed a rebound for the second week in a row, up 11.9% YoY. Baseline and motor vehicle carrier traffic still remain barely ahead of last year on a 4 week moving average, and shipments of waste and scrap metal remain at last year's levels. Intermodal traffic, a gauge of imports, is the reason for the overall rebound, as it is up 10% YoY. The Mortgage Bankers' Association reported an increase of 5.1% in seasonally adjusted mortgage applications last week, essentially canceling out last week's decline. This series remains generally in a flat range since last June. Refinancing increased 17.8%, also rebounding from last week's double-digit decline, but remains near its lowest point since last July 3. Spring selling season is about to begin, and the effect of higher mortgage rates is something to watch. The American Staffing Association Index remained at 90 again. This was 13% higher than a year ago, but this series has completely stalled out in terms of relative YoY gains. 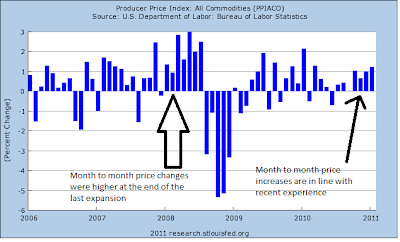 In other words, it has stopped making progress towards its pre-recession peak. The ICSC reported that same store sales for the week of February 19 increased 3.0% YoY, and also increased 2.6% week over week. This series' YoY comparisons had been trending lower since the first of the year, so this is actually quite good. On the other hand, Shoppertrak reported that sales actually declined 0.4% YoY for the week ending February 13. This is the second YoY decline in a row. 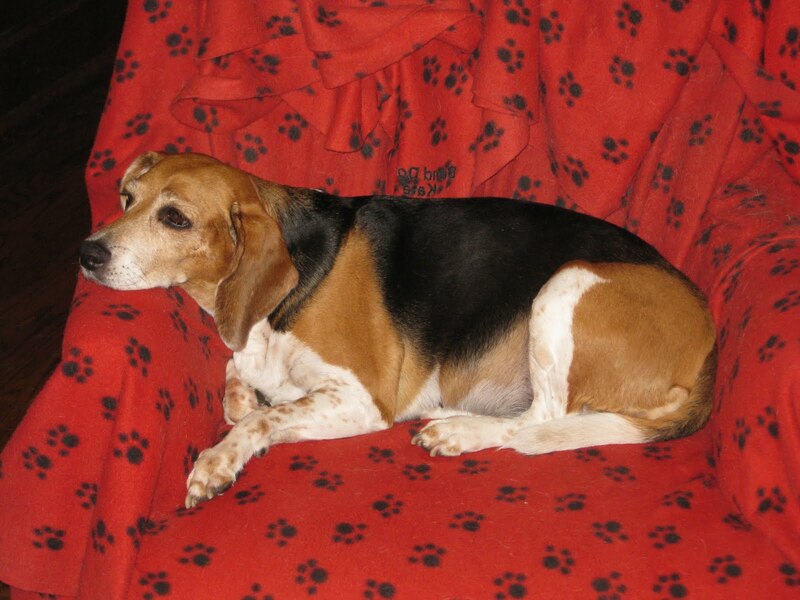 Shoppertrak believes this can be attributed to the calendar effects of President's Day. On a week over week basis, sales increased 5.4%. Weekly BAA commercial bond rates dropped -.07% to 6.15%. This compares with a -0.8% decrease in the yields of 10 year treasuries to 3.60%. Both series are near recent highs, but there is still no relative weakness in corporate bonds. M1 was down 0.5% w/w, up 1.6% M/M, and still up a strong 9.0% YoY, so Real M1 is up 7.3%. M2 was up 0.1% w/w, up .8% M/M and up 4.1% YoY, so Real M2 is up 2.4%. M2 has dropped back below the 2.5% "green light" zone. Adjusting +1.07% due to the recent tax compromise, the Daily Treasury Statement showed adjusted receipts for the first 16 days of February of $119.9 B vs. $123.5 B a year ago, for a loss of -3.0%+ YoY. For the last 20 days, $147.7 B was collected vs. $143.4 B a year ago, for a gain of 3%. This 20-day gain is poor compared with most comparisons over the last 10 months. In the case of the dueling inflection points, I expect Oil prices to win. The question is, whether this recent spike is a blip, which will be reversed shortly, or whether there will be pain at the pump again this spring and summer. I am up to my eyeballs in work today. Weekly indicators will be posted in full tomorrow. 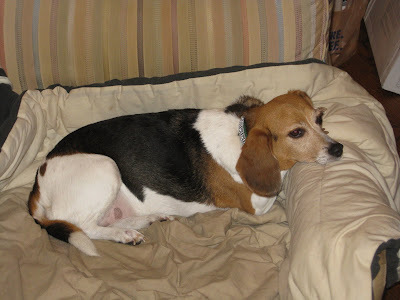 In the meantime, maybe the proprietor of this here blog's doggies have done something endearing this week? First, we have to give credit to the German government for a slate of reforms and programs that have really helped job creation. Germany (much like Spain) had a chronic unemployment problem, a result of a labor market that was too highly regulated and offered too much protection for workers. German policymakers began to change the system back in 2003 with a series of measures that made the labor market more flexible and encouraged greater participation in the workforce. Then during the Great Recession, the government and corporations devised all sorts of schemes to prevent the kind of mass layoffs that plagued the U.S. Most interesting was a government-funded short-time work program. Companies put workers on reduced working hours rather than laying them off; the government stepped in with subsidies that paid part of the workers' salaries. But there is something much more fundamental going on as well. German industry is committed to making the sort of high-quality, high-performance, innovative products for which the world will pay extra. In other words, Germany is making BMWs, not Chevys. If you're making a BMW and charging so much for it, you can manufacture in a high-cost environment and still make a nifty profit. If you're making a Chevy, which to a greater degree competes on price and doesn't have a strong brand reputation, you can't charge the premium that makes profitable manufacture in the U.S. as easy to accomplish. Germany manufacturers are extremely focused on quality, engineering and research & development, and that shows in the products they make, and the prices they can charge. They make stuff that can't so easily be reproduced elsewhere. So even though Germany is being challenged by Chinese industry, German companies have managed to stay a step ahead as well. In other words, it all gets back to innovation, in whatever industry you happen to be in. Even that's not the whole story, however. There is something much harder to define behind Germany's jobs miracle. That has to do with the commitment of executives to keeping jobs in Germany. Sure, German companies have opened factories in China and outsourced to Eastern Europe. Yet many German firms are stubbornly maintaining a certain amount of production within Germany as well. Part of the reason is skills. Germany has a lot of very talented engineers and assembly-line workers who are crucial to making those high-quality products that sell for so much money. But I'm going to speculate that part of the reason can be found in Germany's corporate structure. The backbone of German manufacturing is small to mid-sized firms that are often family-owned. These families are in many cases committed to keeping factories at home. Though they want, of course, to make as much money as possible, they're not under the same pressure from shareholders to show bigger and bigger profits each quarter. That allows them to take a long-term view. German management also just seems more determined to find ways of staying profitable while still manufacturing in Germany. The chairman of power-tool maker Stihl, Bertram Kandziora, told me that U.S. companies "don't try hard enough to keep production inside the country.”. That's especially true, he pointed out, since labor costs in Germany are actually higher than in the U.S.
As I noted last week, two indicators - initial jobless claims and the price of Oil - were nearing inflection points. Yesterday the 4 week average of jobless claims came within a whisker of crossing the 400,000 threshold consistent with a self sustaining recovery that adds more jobs than it needs to accomodate population growth. This week the price of Oil actually did cross the threshold of 4% of GDP (about $94 a barrel based on the latest data) historically associated with economic slowdowns and recessions. As I indicated last week, I'm a little less sanguine about this than my co-blogger Bonddad, whose latest post is just below, here. Professor James Hamilton has done some excellent work on oil-induced recessions, but all of those involved (1) a sudden spike in Oil prices that (2) with one exception went substantially above the 4% of GDP threshold. What his data doesns't have much to say about is the few cases where Oil has gradually approached or brushed the 4% threshold. In the 1990 recession, there was a spike that just passed the 4% threshold. The only other occasions are 2005-2007, last spring, and now. Note first of all tht in general gas prices track economic growth. As there is more growth, there is more demand, and prices go up -- up to a point. Secondly, note that in 2005 (Katrina) and 2006, when gasoline crossed $3/gallon, the S&P 500 backed off. Indeed in 2006 GDP slowed down for one quarter to a just barely positive crawl. Both of these spikes to ~4% of GDP were short-lived. When in 2007 prices decisively moved through the barrier, the S&P anticipated that move by a couple of months. Finally, last spring when Oil brushed $90 a barrel (4% of GDP then), the S&P backed off 15%, and GDP immediately slowed to 1.7%. In all of these cases, of course, Oil was not the exclusive culprit, but the pattern remains. 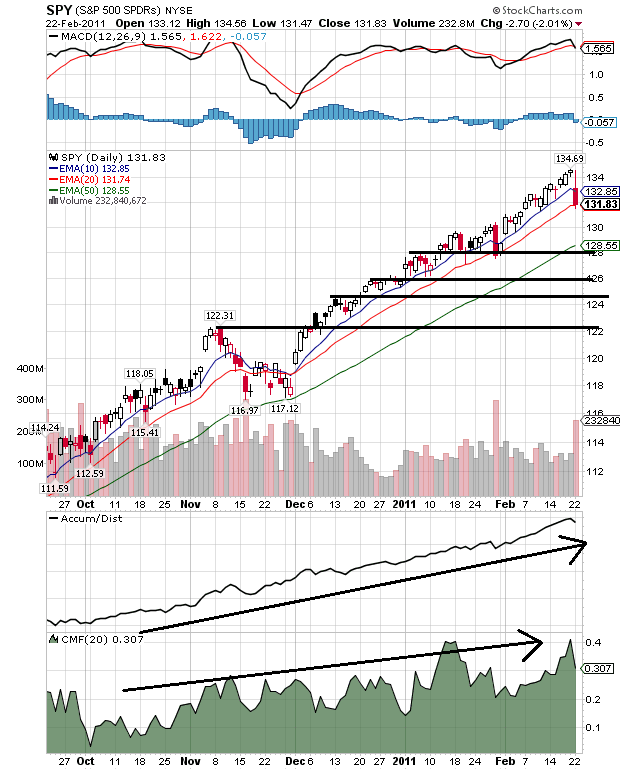 The 15% downward move in the S&P last spring described above shows up more clearly here. While again generally energy prices are highly positively correlated with economic growth, note that this week as gas prices moved decisively above $3 a gallon, and Oil shot up from ~$90 a barrel to briefly over $100 a barrel, the stock market moved inversely to those prices, showing that the inflection point has been reached. While as I say I am less sanguine than Bonddad, our points of view (and that of Prof. Hamilton) are not that different. Prof. Hamilton expects a few tenths of percent of GDP to be shaved off by prices as of a few days ago. I am expecting a slowdown similar to spring of last year - and I believe that is already showing up in real retail sales, for example. So long as Oil supply from the Mideast is not disrupted, that is all I am expecting. Specifically, I do not foresee a "double dip." If on the other hand, disruptions in supply or speculation do cause Oil prices to continue to climb another $20 a barrel (or about $.50 a gallon of gas) as they have in the last 5 months, there will be further damage and I am sure Prof. Hamilton will agree with that. 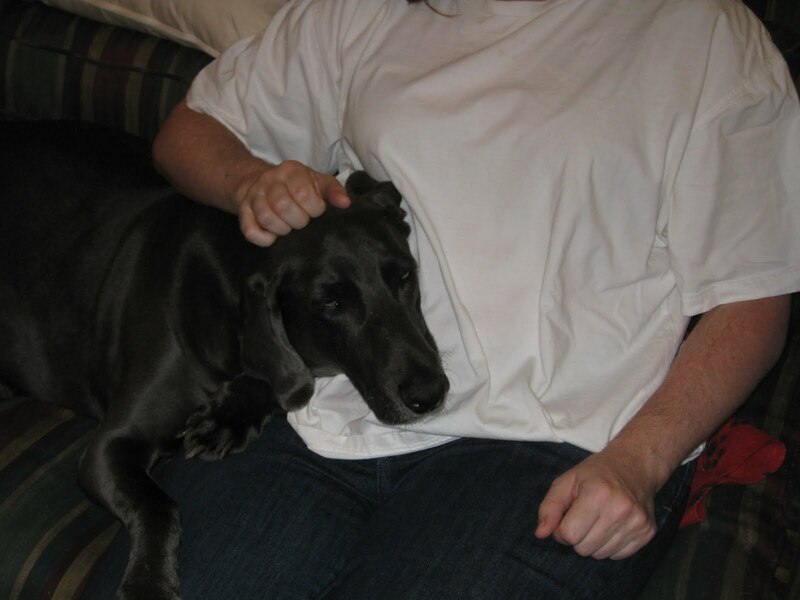 In the Bigger Picture, it would be nice if Versaille could look beyond trying to apply the Shock Doctrine to seniors and the states, and actually take action that would begin to immediately loosen the choke collar that is Oil around the neck of the economy. A commenter asked me if I thought the current price spike in oil changed my outlook. First, I believe the evidence is clear: the U.S. economy is in the middle of a recovery. We've had six straight quarters of GDP growth, a solid manufacturing sector and a recovering service sector. Other countries are growing, which is giving strong support to U.S. exports. 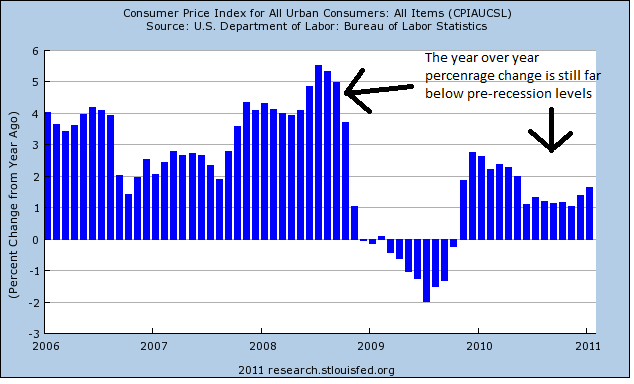 PCEs are now higher on an inflation adjusted basis than pre-recession levels. The two laggards are employment (which is typical as it is a lagging indicator) and housing (which will be a problem area for the next year at least). So, will the current spike in oil prices derail the recovery? I don't believe we are there yet for several reasons. First, the events in the oil market are only a week old. (although they seem to have gone on far longer). Second, I think the overall economic recovery now has legs -- the recovery is no longer fueled by government spending and inventory restocking but by broader based foreign and domestic demand. As previously mentioned, PCEs are up and increasing; retail sales (a smaller subset of this data) are also doing well. Businesses are investing and commercial real estate is coming back. While the increase in demand is still new, it is there. A broader economic recovery implies one that is harder to slow down by external shocks. My bottom line is that events as they have unfolded so far are not in the same ballpark as the major historical oil supply disruptions, and are unlikely to produce big enough economic multipliers that they could precipitate a new economic downturn. They might shave a half percent off annual GDP growth, but I don't anticipate a whole lot worse than that. But the worry of course is that the big geopolitical changes we've been seeing didn't stop with Tunisia, and didn't stop with Egypt. So maybe it's not a good idea to assume it's all going to stop with Libya, either. According to our analysis, a $10 increase in oil prices translates into roughly a 25 cent increase in retail gasoline prices. Every one penny increase in gasoline is then worth about $1 billion in household energy consumption. (In decimal terms, it is actually $1.4 billion.) Therefore, a sustained $10 increase in oil prices translates into $25 billion in additional household energy spending. Assuming this price rise crowds out spending elsewhere in the economy, effectively acting as a tax, means that a sustained $10 rise in oil prices reduces annual real GDP growth by 0.2%. Therefore, we would need oil prices to rise substantially from their current level and then remain elevated for some time before becoming more concerned about economic growth. Reduce GDP growth by about 0.3 percentage point over the first half of the year and by 0.2 percentage point over the entire year. Headline PCE inflation would be about 0.1 percentage point higher over the year, and the unemployment rate about 0.1 percentage point higher. Nevertheless, these results suggest that if the energy futures markets have the extent and magnitude of the crisis in North Africa and the Middle East properly gauged, the economic fallout for the U.S. is likely to be relatively modest. An important caveat is that the simulations reported here assume that product prices, the prices that really matter, will move proportionally with crude prices. However, since the shift toward diesel fuel consumption in Europe has put a premium on light sweet crudes, the relationships among the prices of oil of varying qualities has changed dramatically of late. 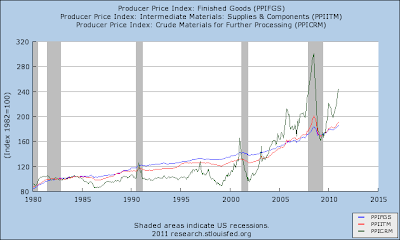 As a result, the relationship between any particular crude price and product prices has also broken down. This fact puts a somewhat larger confidence interval around these results than would be the case if these prices were more or less moving together as they have historically, over most periods. Also see this article at Angry Bear. Let me add a few caveats. First, as I mention above, this has only been going on for a week. The longer this lasts, the greater the damage that can be done to the economy. Think of it as a sliding scale. However, looking at the price chart, we see a price spike last a few days, not weeks. That's a very important point to make. Second, consider professor Hamilton's second paragraph. As this wave of change sweeps the Middle East it is entirely likely we'll see profound change in the oil market. That uncertainty will increase prices -- and the more uncertainty the worse the effect will be (leading to higher prices). However, so far, I would simply classify recent events as a "bad week" of data that can easily be resolved by a peaceful resolution to the ME situation. I've just switched to a new computer and I'm still transferring programs etc.. Quote tracker takes a bit of time to "reprogram" on the new computer. These will be back on Monday. There has been a great round robin discussion on international trade in the economic blogsphere over the last week or so. I believe it started with this article from William Polley and was followed up on by Mark Thoma and Kash over at Angry Bear. I wanted to throw my two cents into the discussion as it were, especially as it relates to manufacturing jobs and the overall benefits of international trade. Let me first make what I believe are two very important points regarding this discussion. There seems to be a desire to return to the "glory days" of US manufacturing in the 1950s and 1960s when a manufacturing job could provide a middle class wage etc.. There is one problem with this argument: there is no way that will happen again. The glory days of US manufacturing were great, but were also characterized by a massive lack of competition. After WWII Japan and Europe were literally in ruins; Russia and Eastern Europe were behind the Iron Curtain, China was under Mao and India was an economic basket case. In short, the US was the only game in town. Hence, our labor market benefited from being a monopoly. As we see various regions of the world come back on line we start to see the effects of the competition on the US labor market. I wouldn't call the situation a degradation or a collapse. Instead, I would argue we're now simply one of many choices for the location of a manufacturing facility. Hence, we have to compete along many different criteria, some of which where we are at an extreme disadvantage. Second, as other countries came on line economically, the US was the largest world economy with a higher standard of living competing with lower cost alternatives. Given that situation, its far more likely poor countries will start to take away market share, thereby lowering the US' manufacturing base and negatively impacting our standard of living. Remember -- economics is the science of studying how we allocate scarce resources. If the US was eating the whole pie and now other people want a slice, we, by definition, get less. More practically, if a manufacturer was looking to start a new plant in the early 1990s and narrowed his choices down to China and the US, chances are China would win for one simple reason: their labor costs were far cheaper, even after counting in price factors such as transporting the product back to the US. So, before moving forward, let's sum up the two points. 1.) The U.S.' previous position as the manufacturer of the world was caused by lack of competition. 2.) Because the US was at the top of the economic heap, it was far more likely we would be negatively impacted by international trade. If we economists stubbornly insist on chanting 'free trade is good for you' to people who know that it is not, we will quickly become irrelevant to the public debate. In other words, it's hard to tell someone who has lost their job to an overseas competitor that free trade is good for you. Fair enough; I won't try and make the argument. However, I believe the excerpt misses the mark. I think the better way to phrase the issue is in a developing country, the benefits of free trade are exciting and vibrant, whereas here they are far less exciting. For example, living in China right now -- and over the last 10 years or so -- would be an exciting time. The middle class is growing; there are more and more jobs available; GDP is up, wages are slowly increasing -- you get the idea. Someone who looks around in China now and compares it to ten years ago sees the benefit of international trade and thinks "great." However, the benefits in the US are far less visceral and far harder to sell. For example, in my opinion one of the biggest benefits of free trade is lower inflation -- as we import lower cost goods from overseas, we have less inflationary pressure. I think that's a great benefit. But, it's also really hard for non-econo-geeks to get truly excited by that benefit. And frankly, I can't see a PSA swinging public debate to our side. Then there is the issue of more, lower cost products to choose from. We also like that, but, again, it's hard to sell. And then there are the export markets we have for our products. But the problem here is, thanks to higher productivity over the last 20 years, US manufacturing needs less labor. Plus, once, the goods leave our shores, they're gone. In other words, the benefits for us are very hard to see. All this leads to the primary point: free trade does provide numerous benefits. But the problems for us seem far more tangible and the benefits seem far less exciting than for the beneficiaries in the developing countries. Now, let's turn to how to deal with the negative ramifications. First, as I mentioned at the beginning of this, it's important to be realistic. We're not going to return to the age when any person has a job for life and is only employed by the same company. The general historical background that led to that scenario don't exist. Please stop arguing from the perspective that it can be duplicated. Secondly, industries will disappear. I realize this is a rather unpleasant thought, but there are times when other countries will make better and cheaper products. This is especially true as products become commoditized. While we can erect trade barriers to shield industries (the textile industry comes to mind), all we're doing there is putting off the inevitable. We need to be realistic about industries that are currently marginal (again, textiles come to mind) and start to help the labor force make the transition. Third, the US labor force needs to be highly educated. Lower cost -- and less intellectually intensive -- manufacturing booms in other countries, but not here. While US manufacturing is currently booming, it's important to remember that we handle far more advanced manufacturing and assembling that requires a smarter work force. To that end, we need to make life long learning the norm, and this learning must be inexpensive. The current method of funding education -- lower governmental inputs and higher individual debt levels -- is at best counter-productive and at worst leads to a life of near indentured servitude as recent graduates work to pay off debt for the first part of their professional lives, thereby preventing them from saving money etc... Instead, education needs to be cheaper and available to increase the skill set of our labor force. Fourth, the US government needs to establish a list of potential industries that we can do here. I always recommend nano technology, stem cell research and alternate energy, but there are many others. The government should fund the pure research that forms the intellectual basis of these industries, probably through the college/university system but also through government programs and agencies. And yes -- this is governmental direction of the market -- but direction that will work. Why? Anyone remember all the benefits of the space program? From products like Velcro to aerospace applications, NASA spun off literally thousands of benefits. The internet was created by the military so the country could have a communication system in the event of a nuclear attack. And government funding of research for medical cures spills over lots of ways. Anyway -- as I mentioned at the beginning -- that is my two cents. Last week I wrote that initial jobless claims was one of two series that appeared to be at inflection points. By that I meant that a small move in either one could result in the economy "turning a corner" - but in opposite directions. This morning's report that Initial jobless claims were only 391,000 brings the 4 week moving average down to the lowest point since before the September 2008 meltdown: 402,000. A number of ~410,000 or less next week will bring this average under 400,000. The inflection point is that such a number is consistent with average monthly job growth in excess of that necessary to keep up with population growth. It is also consistent with a continuing decline in the unemployment rate. In short, it represents an economy attempting to achieve escape velocity. With the exception of the two post-January storm outliers, in the last two months every single week has been under 420,000. And now we have had 2 numbers under 400,000 in the last 3 weeks. This is good news - or at least pretty close. I've just completed a new research paper that surveys the history of the oil industry with a particular focus on the events associated with significant changes in the price of oil. Here I report the paper's summary of oil market disruptions and economic downturns since the Second World War. Every recession (with one exception) was preceded by an increase in oil prices, and every oil market disruption (with one exception) was followed by an economic recession. How much are gasoline prices weighing on consumers? Finally, from a real world perspective, Libyan oil production may have already shut down at least 350,000/BBL/Day of production although, a shut down of 500,000 is not unlikely. The Consumer Price Index for All Urban Consumers (CPI-U) increased 0.4 percent in January on a seasonally adjusted basis, the U.S. Bureau of Labor Statistics reported today. 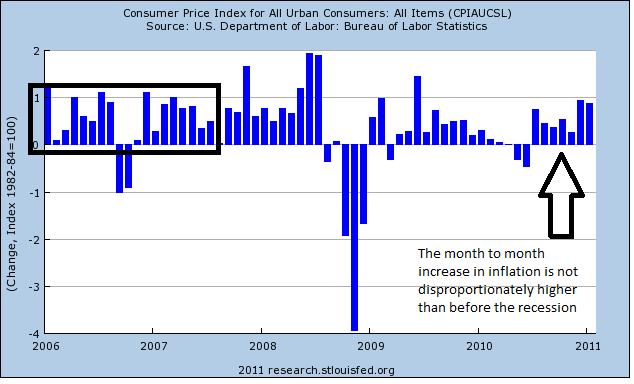 Over the last 12 months, the all items index increased 1.6 percent before seasonal adjustment. 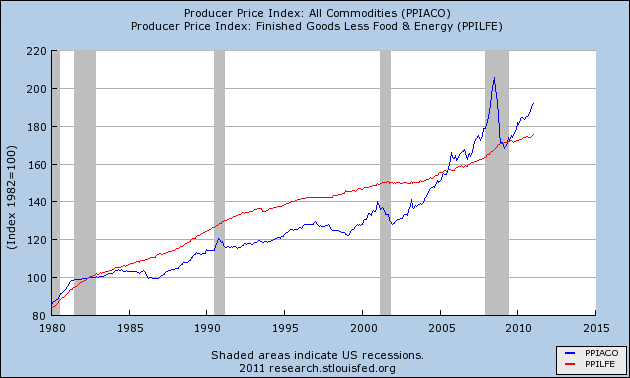 Increases in indexes for energy commodities and for food accounted for over two thirds of the all items increase. The indexes for gasoline and fuel oil both increased in January, continuing their recent strong upward trend. The index for food at home posted its largest increase in over two years with all six major grocery store food group indexes rising. The index for all items less food and energy also rose in January. The indexes for apparel, shelter, airline fares, and recreation all posted increases. In contrast, the indexes for new vehicles and for used cars and trucks declined in January. Over the last 12 months, the food index has risen 1.8 percent with the food at home index up 2.1 percent; both 12-month changes are the highest since 2009. The energy index has increased 7.3 percent over the last 12 months, with the gasoline index up 13.4 percent. The index for all items less food and energy has risen 1.0 percent. Let's take a look at the data in graph form. First, notice that the month to month percentage increase over the last six months is more or less in line with the rate of increase before the recession. In other words, our current experience is not out of line with past experience. 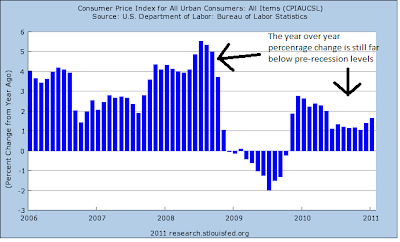 Just as importantly, the year over year percentage increase is still below previous levels, indicating inflation is not out of control in any way. With food prices spiking, it's important to remember that food as a percentage of income in the U.S. is the lowest in the world. 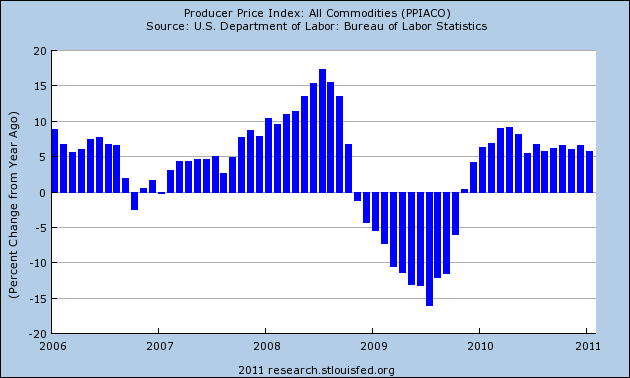 Hence, it's it's far easier for the U.S. to absorb rising food prices. 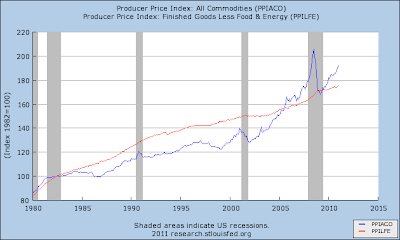 However, private transportation prices represent 16.082% of the CPI, making energy prices a bit harder to shake off. The events of the Middle East -- first and foremost -- are reminding me of the democratic changing of the guard that occurred in Eastern Europe. Watching the events from afar is fascinating and scary. More importantly, these types of events can cause fundamental disruptions to the stock market as they cause a realignment of trading strategies. Here are some general points to look for. The US markets have been in a strong rally for some time. 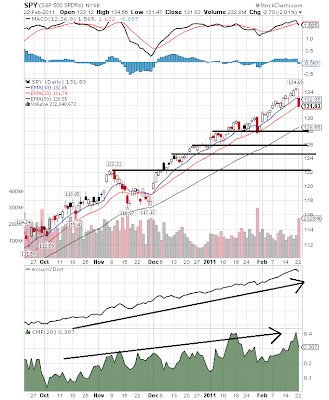 The A/D line has been rising and the CMF confirms an inflow of money in the market. 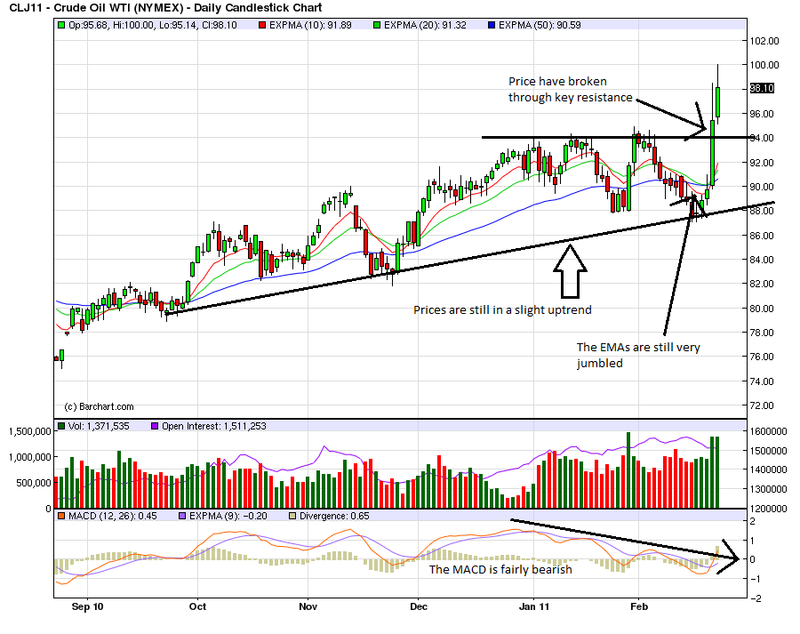 But this type of event could be the catalyst for a correction. Yesterday, the SPYs fell to the 20 day EMA. 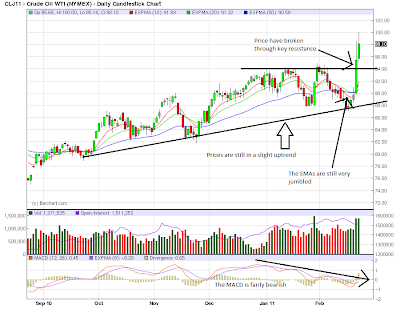 The next logical area of support is the 50 day EMA, which is currently at 128.55, or 2.5% below current price levels. A sell-off that stops at this level would be a baby correction. I've drawn support lines -- most of which occur near round numbers (click for a larger image). Finally, remember that sell-offs are good things, as they weed out the shaky longs. Big upward revisions to an already accelerating consumer confidence report point to a pivot higher for the consumer sector. The Conference Board's index rose to 70.4 in February for the best reading in three years. January was revised more than four points higher to 64.8. The assessment of the jobs market definitely improved. On the current assessment, a reading that offers an indication on the monthly employment report, fewer consumers in February said jobs are hard to get, at 45.7 percent vs January's 47.0 percent. On the outlook, substantially fewer consumers, at 15.4 percent vs January's 21.2 percent, see fewer jobs six months from now. 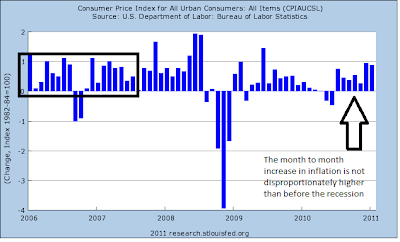 In a partial offset, fewer consumers see more jobs ahead, 19.8 percent vs January's 20.8 percent. Upward revisions are especially striking in the assessment of future income which before this report had been in unprecedented inversion, that is more saw their income decreasing than increasing. Not anymore as 17.3 percent of the roughly 3,000 initial sample see their income improving vs 13.8 percent seeing a decrease. Revisions now show the inversion reversing back in December. 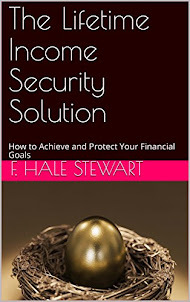 The prospect of future income is a critical assessment when making decisions on discretionary purchases. Revisions now show big gains for buying plans especially for cars and appliances. Home buying plans are still depressed but a little less depressed. The number is still pretty low by historical standards, so I'd be cautious to read too much into this move. In addition, with gas prices going up (and today's price spike) I think this number will come under strong downward pressure in the near future. 3.) There is a giant press conspiracy to paint conservatives in a negative light which warrants my near paranoid methodology of interpreting press stories. 1.) Money is evil and those whose incomes are above $75,000/$100,000 per year are clearly in league with Satan. 3.) Positive economic numbers are rigged; negative economic numbers are sacrosanct. As a corollary, all bullish economists are tools while bearish economists are completely trustworthy. Finally, take one bad economic number in a series of good numbers and claim it is a sign that the end of the world is upon us. While I may have missed some of the popular themes, the point is clear: U.S. political dialog is not about data or solving problems. Instead, it's about repeating talking points and cramming events into preconceived perceptions. NDD has pointed out this is "confirmation bias," meaning we only seek out opinions that confirm our preconceptions, regardless of the lack of data "supporting" our opinion. People on the right can remain in a sealed echo chamber of talk radio, Fox news and right wing blogs. People on the left can remain on the political left's blogs. Both of these methods of information delivery have been taken over by extremists who could care less about data and facts, instead focusing on pushing the latest "meme." In short, the political blogs have become pure garbage. Assume that any economic analysis from any of them is -- at best -- deeply suspicious, and, at worst, pure crap. The Producer Price Index for finished goods rose 0.8 percent in January, seasonally adjusted, the U.S. Bureau of Labor Statistics reported today. This advance followed increases of 0.9 percent in December and 0.7 percent in November and marks the seventh straight rise in finished goods prices. At the earlier stages of processing, prices received by manufacturers of intermediate goods moved up 1.1 percent, and the crude goods index rose 3.3 percent. 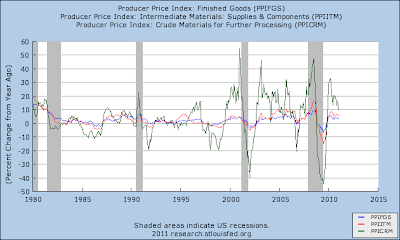 On an unadjusted basis, prices for finished goods advanced 3.6 percent for the 12 months ended January 2011. Notice that the recent price increases are in line with the increases seen at the end of the last expansion before the huge spike in prices. 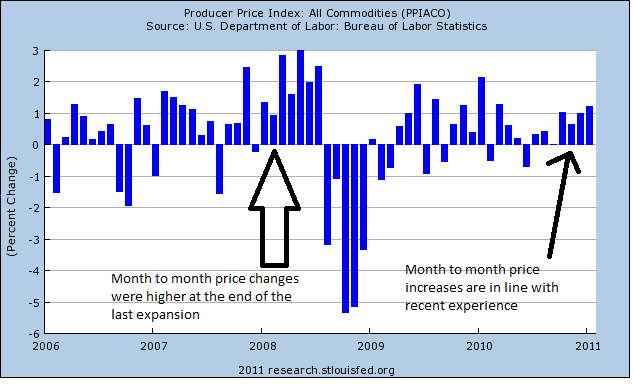 While this could mean overall PPI is "heating up" we would need more data to confirm the trend. First, it's been over a year since the large drops of PPI into negative territory, so the YOY numbers are less skewed by the extreme movements during the recession. Notice these numbers are right in line with those seen during the last expansion. 1.) During the 1990s expansion, total PPI prices were far tamer and actually decreased for a period near the end of the expansion. 2.) Total PPI was far more volatile during the last expansion. 3.) So far, it appears the PPI is behaving more like it did during the 2000s expansion, with far more volatility. 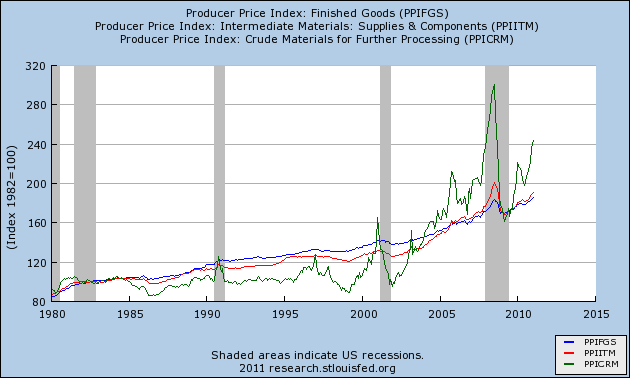 The above chart shows crude, intermediate and end producer prices for the last 30 years. 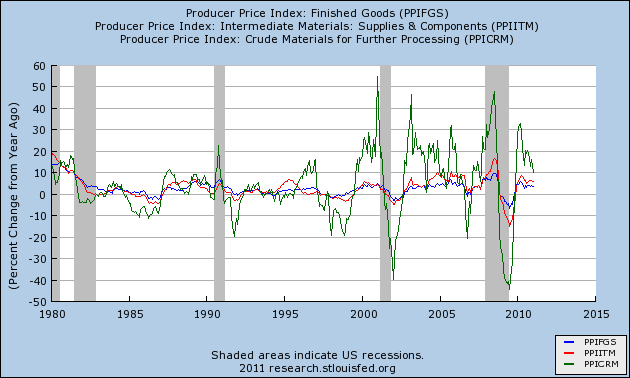 Notice that we can group these prices into two groups: crude prices (which are far more volatile) and intermediate and finished PPI (which are far less volatile). Also note the intermediate stages of production appear to absorb the price increases of crude goods very well and by the time we get to finished goods the impact of crude price volatility is noticeably diminished. The above chart simply highlights the previously mentioned point in a year over year format. In short, the above historical data indicates later stages of production have the ability to absorb the highly volatile nature of crude prices, which is good news, as it appears we are in the middle of volatile crude price markets.